Conservatives are selling themselves short in one of the most important battles in contemporary politics, the battle over the environment. Rather than offer a considered principle-based, rationally developed approach to effectively counter liberals on this field of issues, conservatives debunk, diminish, and dismiss environmental concerns (even legitimate ones) calling environmentalists “wackos,” a la Rush Limbaugh and Glenn Beck. (And we know where name-calling got Rush). Or they offer “light” versions of liberal policies a la Newt Gingrich’s A Contract With The Earth or Mitt Romney’s “shifting” position on global warming. What more revealing way is there to admit you are totally devoid of ideas on any issue than to be reduced to adopting your opponents’ policies and trying to sell them as your own? One downside to this conservative concession to liberals in environmental politics is that it amounts to an abandonment of the many conservatives who are concerned about the environment in a variety of ways and would love to have a way to address those concerns without having to join an environmental (i. e., liberal) group. Neither name-calling nor liberal-conservative cross-dressing does anything to address those concerns. Nor do either of those dead-end tactics do much to convince any of the liberals and independents in the environmental constituency to cross the political aisle. If you’ve been following this blog you’re familiar with many of those liberal failures and conservative successes. 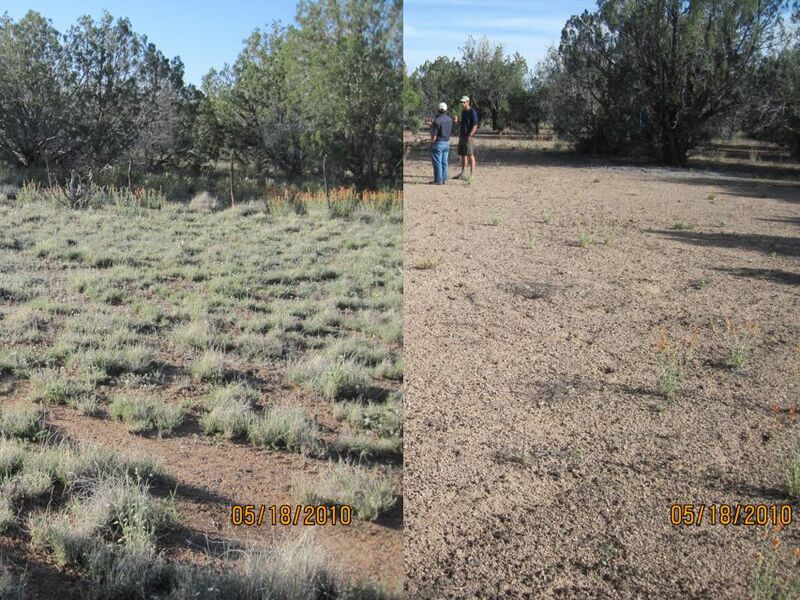 And there’s the Drake Exclosure, a study plot set up to illustrate the effectiveness of the liberal panacea for all environmental problems “returning the land to nature.” Within this exclosure, land protected for more than 65 years remains as much a desert as when the liberal panacea was applied. Outside the exclosure, where the land has been grazed by the cattle of a local rancher for those same 65+ years, there’s a healthy stand of native plants and plenty of evidence of native wildlife. These examples have been described many times on this blog, and I don’t want to overuse them, but they’re too good not to mention in this context. There are, however, plenty of other skeletons in the liberal environmentalists’ closet. For instance, in California, the Bay Checkerspot Butterfly, a threatened species, can no longer be found on portions of its habitat that environmentalists have had protected for the butterfly’s benefit. The Bay Checkerspot continues to thrive, however, on land that continues to be used by humans for livestock grazing. On the Sedgwick Reserve near Santa Ynez, California, on a ranch gifted to the University of California under the stipulation that it continue to be grazed, exclosures were fenced from cattle to show how protecting the land from grazing also protected it from invasion by nonnative grasses deemed detrimental to ecosystem health. The last time I visited the reserve (about 5 years ago) those exclosures were nearly pure stands of the invasives they were supposed to repel, and outside the exclosures, on land that continued to be grazed, there were healthy stands of native grasses dominated by California’s state grass – nasella pulchra or purple needlegrass. The liberal solution to all problems, not just environmental problems, is to increase “protection” in the form of government control, (which means liberal control). That’s the logic behind the passage of the Endangered Species Act and the National Environmental Policy Act , and other such legisation– to increase government control over human impact in the form of private management. But if government management is so good for endangered species, and private management so bad, why is it that, according to the Government Accountability Office in 1994, more than 80 percent of species listed as endangered or threatened spend at least part of their time on private lands. A more recent study by the Association of Biodiversity Information and The Nature Conservancy confirms that half of listed (Threatened and Endangered) species have at least 80 percent of their habitat on private lands. An environmentalist might counter that, here in the West, land that has been claimed as private is usually the best land, usually with water, and that’s why these species spend so much of their time on private land. One could re-counter that here in the West private land is also extremely rare. Only about 17% of Arizona is private land. The rest is public — federal, state and Indian reservation. Most other western states have similar disparities between private and public land. Thus, in the West, more than 80 percent of species listed as endangered or threatened crowd themselves, at least part of the time, onto the 15% of the land that is private. Half of listed species have 80% of their habitat there, and one third of all listed species can be found only on the 17% of the land that is private. Fleshing out these statistics with specifics, i. e., with examples of conservatives who have achieved environmental successes that make the best achievements of their more well-publicized liberal competitors pale by comparison, one of the most eye-opening is a ranch near Silver City, New Mexico — the U-Bar. This ranch not only produces food and other products to earn the profits that pay for its operation, but it is also one of the most outstanding ecological entities in North America. This ranch is home to the largest and most naturally prolific population of an endangered bird – the southwestern willow flycatcher. 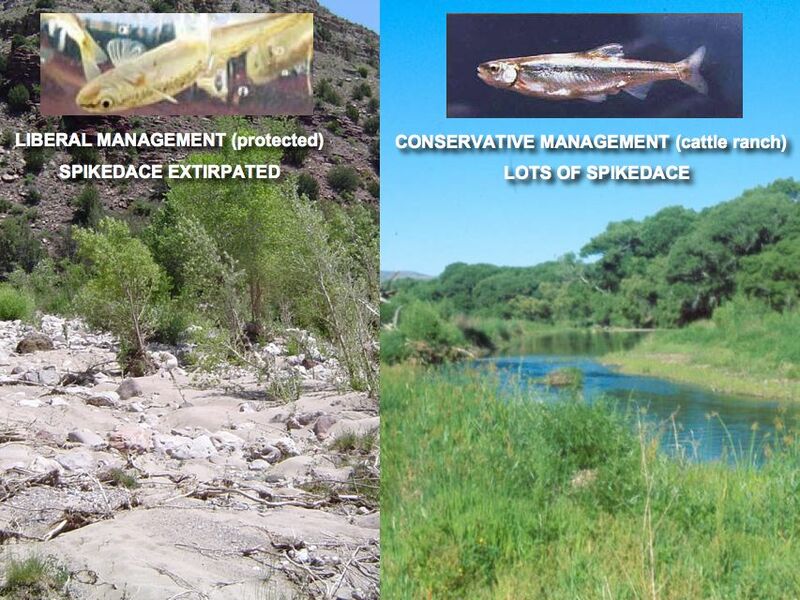 (Two adjacent preserves list the bird as an “occasional visitor.”) It is home to the largest known population of spikedace (the fish now extinct on the Verde River as described above). And the ranch supports significant populations of other endangered, threatened, and rare species as well and the highest density of songbird nesting territories known to exist in North America. This success is a conservative achievement because the ranch is managed to sustain itself economically rather than to operate as a preserve. In other words, the ranch operates under the conservative principle that the healthier a private manager makes his or her land by managing it effectively, the more wealth of all sorts (economic, social, and environmental) it will produce. The U-Bar is stewarded to such a state of ecological health that the natural community that shares the land with the ranch’s livestock prospers and thrives better than those native species do on preserves managed specifically for their benefit. In other words, in this case and in quite a few cases like it, conservatism and the conservative approach works to benefit the environment, including plants, animals, ecosystems, watersheds, endangered species, fuzzy bunnies, etc. in the same way it works to benefit the poor, and those in need of health care, and minorities, etc. — by creating a rising tide that lifts all boats. The reason you don’t read about these successes in the liberal media or in the environmental newsletters is obvious. Mainstream environmentalists are overwhelmingly liberal and the goal of liberals is to expand the reach and power of the instrument by means of which they operate — government. Reporting environmental successes achieved by the private sector obstructs rather than advances this goal. If conservative environmental successes are going to be reported anywhere, however, it is going to be in the conservative media. That is why I believe the creation of a real, concrete, alive and kicking conservative environmentalism is so important. Creating a conservative environmentalism would give the right wing media a context in which to report conservative environmental successes, and thus, the incentive to do so. It would create a story, with conservatives as the heroes and conservative achievements as the victories, that the talk shows could update every day, just as the liberals currently update the controversy over global warming. • The fact that conservative approaches regularly outperform liberal approaches in dealing with environmental problems would no longer go unreported. • The environmental playing field, both in politics and the media, would no longer be conceded to the Democrats. Conservatives would have “skin in the game,” and both sides would have to compete for the support of those of us who make up the environmental constituency. • Even liberal environmentalism would benefit from the creation of a conservative alternative because it would finally be held accountable for achieving concrete results, rather than just enacting liberal policies.